My sisters and I turned out in force for my cousin Dave's last charity performance of his Elvis tribute show before he has to have major surgery next week. Even Mum - who is notoriously tone-deaf and unmusical came along to support him. Dave is 77 now, and has been performing Elvis songs since 1958, raising a huge amount of money for charity. 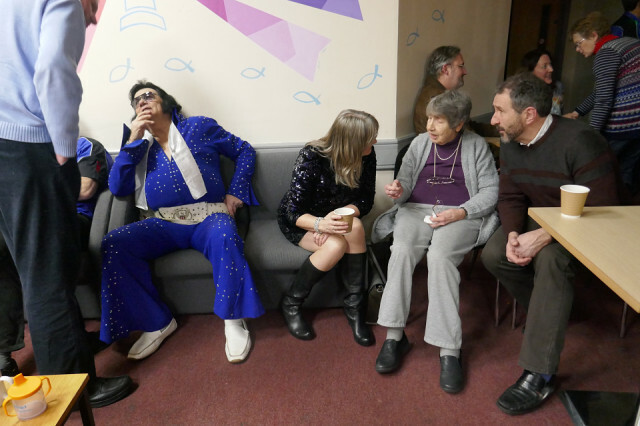 Here he is resting in the interval with Mum, who's talking to my cousin Richard and his wife who had travelled up from Weymouth to support Dave and the band. Mum had the time of her life!